Virginia Board of Physical Therapy 8.0 (Type 1)–Please check with your state board for approval as most physical therapy boards will reciprocate approval for continuing education. The American Academy of Health and Fitness (BOC AP#: P3645) is approved by the Board of Certification, Inc. to provide continuing education to Certified Athletic Trainers. This program is eligible for a maximum of 8.00 Category A hours/CEUs. Once you choose your format below, more information will be displayed about materials and access for that format. The Back Stability: Integrating Science and Therapy™ home study continuing education course is offered to you in a distance-learning format, providing a logical progression from initial concepts to clinical applications. The text introduces the problems of back pain and instability and provides an explanation of spinal anatomy, movements, and the physics of lifting. A discussion follows of the basic skills required for developing stability. Assessments of posture and muscle balance are highlighted, and foundational movements for development of core stability are introduced. After covering the basics, the text moves into more practical applications by presenting progressive exercises and basic equipment used for developing greater stability. Information on abdominal training, resistance apparatus, speed and power, and practical functional progressions will help your patients or clients increase back stability and enhance performance. Finally, real-life patient examples illustrate how to structure a full back stability program. Explain “back stability” and the scope of the problem of back pain. Discuss the model of lumbar stabilization presented in the text. Identify and explain the anatomical components and the biomechanics of the lumbar spine. Identify and explain the stabilization mechanics of the lumbar spine. Discuss the principles of muscle imbalance. Discuss the relationship between posture and stability. Identify and describe muscle balance tests. Explain and demonstrate foundation movements. List and explain the progression steps in stability training. Explain and demonstrate exercises for building back fitness. Define and apply functional training strategies. Perform a preliminary client assessment. Design a stability program based on needs analysis data and established program goals. 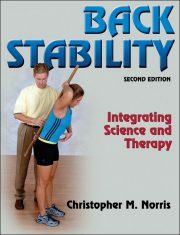 Electronic format — Back Stability: Integrating Science and TherapyTM certificate package with online test includes the eBook version of the 360-page Back Stability: Integrating Science and Therapy, Second Edition book by Christopher Norris (accessed through Adobe Air* with instructions for downloading Adobe Air) and a 106-page workbook provided in PDF format. Instructions for completing the multiple-choice online test and obtaining CECs are also included in PDF format. Note: This course package is made available for immediate access and download after purchase. All materials for this electronic format course are available electronically. Nothing is mailed. Different professional organizations offer continuing education credits, most commonly called CECs (continuing education credits) and CEUs (continuing education units). Most CECs/CEUs require one contact hour of professional activity for one credit. Example conversions are: ACE, NSCA and NASM: 0.1 = 1.0 contact hour; ACSM, BOC, ISSA, WITS and YMCA: 1.0 = 1.0 contact hour. How would you rate this educational activity overall? The quality of materials and program design met my expectations. The information received was useful and beneficial. Evaluations prior to the new system. Promotional materials were accurate and complete. Administrative instructions were complete and understandable. The course content met my expectations. How will you apply the content of this course to your work? What recommendations and/or general comments do you have? to study for next time. I have passed two AAHF "easy" refresher unit (Kid and Sr Fit) and now two AAHF more challenging ones (Exercise Rx and Back Stability). I would like to get into something current, practical and maybe super applicable, like client business development trends or something.